Based on Swiss engineering, the sophisticated concepts even convince with complex challenges. The Airlock Suite combines filtering and authentication in a coordinated overall solution that also sets new standards in terms of usability and services. The Airlock Suite is flexible and adapts to existing environments, new challenges and individual needs. Due to the different requirements, the Airlock Suite offers individual solutions in one complete package. 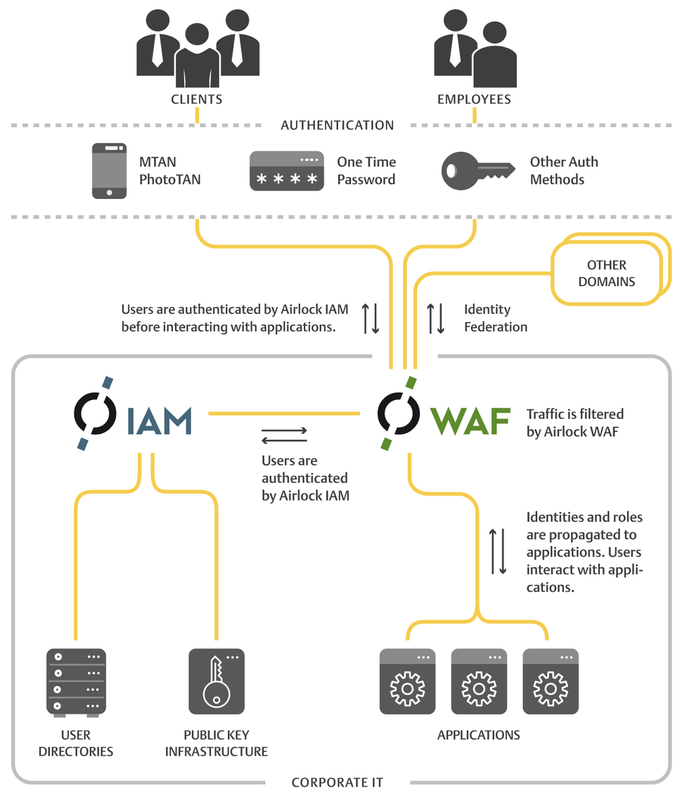 The Airlock Web Application Firewall offers a unique combination of protective mechanisms for web applications. Whether your objective is PCI DSS compliance, security for online banking or protection for eCommerce: Airlock WAF will upgrade security for your internet applications – a permanent solution with a host of well thought-out functionalities. Airlock Login is the perfect addition to Airlock WAF. Meaningful, slim and secure - it enables a reliable authentification and authorisation of users. As a solid basis, Airlock Login lets itself combine with Airlock IAM very easily and activates multiple additional functions. Today nearly every web application requires a user identification for certain accesses. Thanks to the upstream authentification separated from the business logic, Airlock Login allows the central protection of customer- and employee-logins and supports various in-house and external authentification devices (token). The central authentification platform with enterprise mode allows customers, partners or employees a secure access to data and applications with logging on only once and automates the user administration. Why Ergon Airlock by InfoGuard? Long-term cooperation with Ergon / Airlock and a broad customer base. InfoGuard has a dedicated engineering team of certified Airlock specialists,. Certified experts support you from architecture and design to the implementation and operation of your Web Application Firewall.